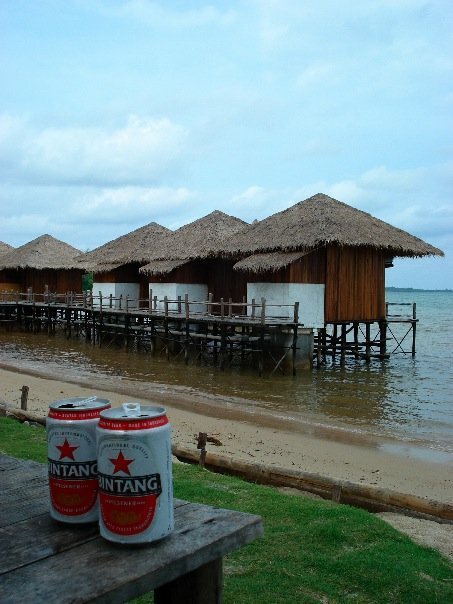 After spending a few days in Singapore, we took a ferry over into Indonesia to have a quick jaunt on Bintan island, which is just an hour away from Singapore. It was very pretty, but not in a typical white-sand-big-resort kind of way. In fact, it didn’t seem to have a tourism industry at all. 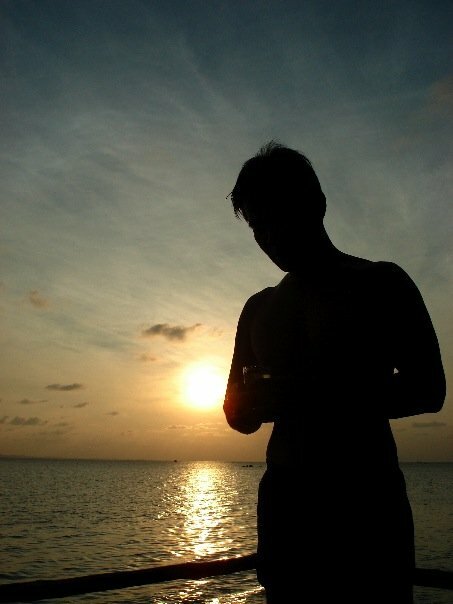 It is nothing like the other islands I’ve been to in Asia, such as Boracay and Koh Samui which are famous tourist traps. The side of the island where we stayed was totally rustic, less developed, and quieter. What I hadn’t expected was the hour and a half drive by car from the north coast to the east cost of the island that took us deep inland on some tiny little roads so remote that I thought perhaps the driver was taking us somewhere to rob us and leave us in the bush. But my paranoia vanished when the ocean finally peeked out at us from a distance, and we arrived at Trikora Beach where we would be staying in the Nostalgia Yasin Bungalows. The bungalows were the cutest place I’ve ever stayed in. The entire thing was constructed out of wood right out into the sea on the shallow beach. 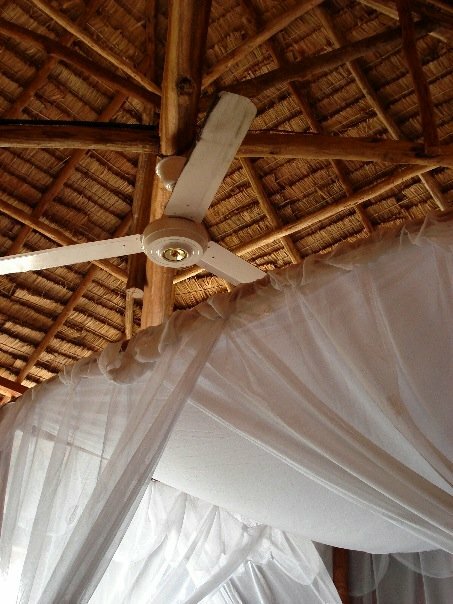 No air conditioning, no TVs, no hot water (which made for some very fast bucket-baths), mosquito nets, and the sound of the sea right under you. At low tide the water receded so far out that you could walk to other small inlets nearby. At night we watched a million stars above us, and slept peacefully with the gentle lapping of the rising ride. One of the best things about Indonesia were the people. Since the east coast was quite remote with pretty much no tourism, the locals are quite curious about you if you walk down the street or go into thier shops. Little barefooted kids constantly waved at us from their houses and gardens, singing out, their hellos with big smiles and shy giggles. We went into a mini-mart and the owner’s daughter, eager to practice her English, held out her hand and said, ‘Hi, I’m Tina! What’s your name? Nice to meet you!’ Even though they lived quite simple lives, not a single person tried to sell us crap, and nobody was begging for a dollar. Certainly very refreshing. 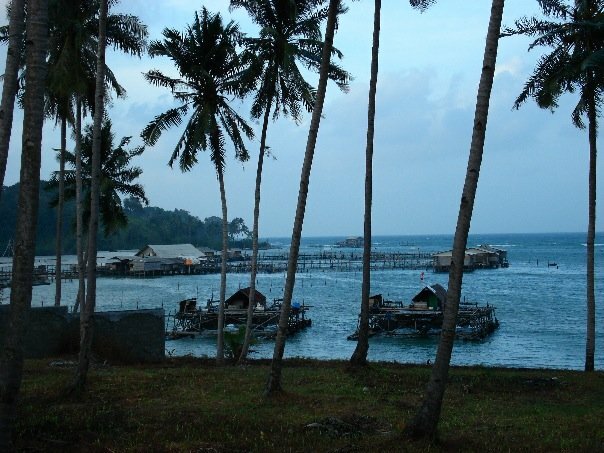 We also had the chance to visit some traditional Indonesian fishing villages. 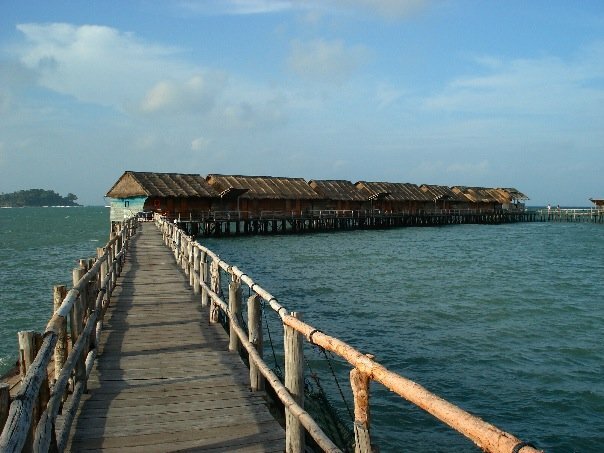 Handmade entirely of wood and built far far out into the ocean, linked with wooden walkways, the whole village is constructed on the water. Don’t ask me how they did it, but those Indonesians surely are crafty people. But don’t be fooled — these are not mere shacks! They may be built entirely from wood and bamboo, but these villages have everything — running water, electricity, kitchens and bathrooms, and believe it or not, even a pool table! A bit further up the road we saw some true floating houses, simply tied on to a buoy and a coconut tree on the beach. We could see the house gently swaying back and forth in the water. I have to assume the east coast doesn’t get many storms, or else this wouldn’t be possible. On new years eve, we took it easy. In fact, I take that back. We took it easy, but we drank heavily. Because there are so many coconut trees around, we got the kitchen staff to chop open a few of the green ones, and I decided to make a popular Trinidadian drink, scotch and coconut water. We busted out the Johnny Walker Red much too early, and were fast asleep in bed even before midnight, sleeping peacefully above the water. Ah well, no worries. New years parties are over-rated anyways. hello! can i know if the yasin bungalows are equipped with toilets in them?